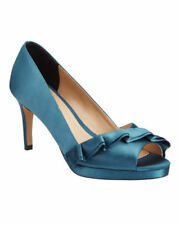 Heel Height: 10 cm (3.94"). All products are quality checked. Otherwise deal is final. Color: Green. We will be happy to resolve any issues you may have in a cordial and friendly manner. Size Reference. Pretty Pale Pink Satin Open Toe Sliders with satin bow at the front, pink comfort footbed, new & unworn, Size 4 (37). 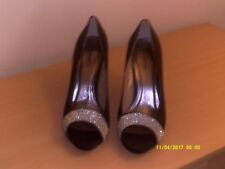 One pair is a kitten heel ankle boot sequined with ivory lace and the other pair is also a kitten heel ivory satin lace-up ankle boot. Both pairs were bought by my wife to try them on before our wedding. Gorgeous Silver Satin Open Toe Sliders, lovely satin bow at the front, silver comfort footbed, new & unworn, Size 6 (39). Brand New in box size 6 Beige satin shoes. Ideal for a wedding. 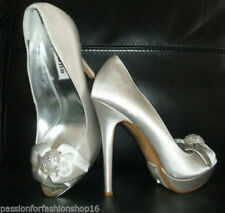 Brand New in box size 6 Beige satin shoes.Ideal for a wedding. Never been worn. Condition is New with box. Dispatched with Royal Mail 2nd Class.